Allows devices to perform automatic configuration to achieve the best possible mode of operation over a link. Transparent Link Pass Through sends a link-loss signal over the fiber, instructing the remote converter to shut down the copper port—thus notifying the end device—while maintaining the fiber link between the two converters. Transition Networks's converters will automatically re-establish link in all network conditions. Pause signaling is an IEEE feature that temporarily suspends data transmission between two devices in the event that one of the devices becomes overwhelmed. Auto-Negotiation allows devices to perform automatic configuration to achieve the best possible mode of operation over a link. Devices with this feature will broadcast their speed (10Mbps, 100Mbps, etc.) and duplex (half/full) capabilities to other devices and negotiate the best mode of operation between the two devices. While the inclusion of this feature is beneficial, the ability to disable it is equally beneficial. In the event of a non-negotiating end device trying to connect to a negotiating device, the mode of operation will drop to the least common denominator between the two devices (i.e. 100Mbps, half-duplex). Disabling this feature gives the user the ability to force the connection to the best mode of operation when trying to link with a non-negotiating device. Most Transition converters with Auto-Negotiation will allow you to disable this feature. Transparent Link Pass Through will notify an end device of a link failure just like Link Pass Through, however it uses a different method for “passing through” this information. 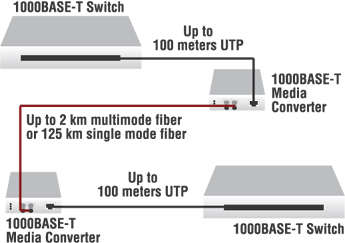 Transparent Link Pass Through sends a link-loss signal over the fiber, instructing the remote converter to shut down the copper port thus notifying the end device, while maintaining the fiber link between the two converter s (see diagram below). Single fiber technology offers a 50% savings in fiber utilization. It is an attractive solution to maximize the usage of a limited number of fiber runs. In a traditional optical link, a fiber pair consists of two uni-directional strands. The single fiber technology multiplexes two optical wavelengths of 1310nm and 1550nm into a single strand fiber. In a single fiber media converter each wavelength is responsible for either the transmit or receive function. Consequently, the bi-directional transmission is achieved by using a single strand. The converters in a single fiber scenario "match" each other's wavelengths. Converter A transmits at the wavelength of 1310nm and receives at 1550nm while the other converter transmits at 1550nm and receives at 1310nm. Therefore, converters are usually used in pairs. Single fiber technology is available on all Transition Networks Media Converters in maximum distance ranges from 20 to 80km. Migrate to Gigabit Ethernet in a cost-effective manner. Used in conjunction with lower cost 1000BASE-T switches, companies can take advantage of the high bandwidth Gigabit Ethernet offers without all of the higher costs. Transition 1000BASE-T to SX/LX converters allow users to extend the bandwidth to those users outside the reach of the 1000BASE-T standard (up to 125 km).